My Mother's Garden features 2X Grammy Winner, Mary Youngblood on native flute; People’s Choice Award Winner, Jenny Bird on background vocals; celebrated cellist and symphony director, Ron Clearfield; Mary Redhouse on vocals and native flute (Best of Tucson and Grammy nominee); Amo Chip from the Carlos Nakai Quart on background vocals; Chuck, The 'GreenMan' Willhide on guitar and background vocals; John Keane on pedal steel guitar (REM, Widespread Panic); Stuart Munro on lead acoustic and electric guitars (Juno nominated, Sunyata), among other notables. Produced by Thea with John Keane. Recorded at StarPony Studio (Highlands and Asheville, NC), John Keane Studios (Athens, GA), Spiritsound Recording Studios (Sylva, NC), Cavern Recording Studios (Tucson, AZ) and engineered by Thea, Chuck Willhide, John Keane, Victor Hamilton and Bill Cashman. Mixed by John Keane, Victor Hamilton and Bill Cashman at their respective studios. Mastered by Air Show Mastering at Takoma Park Studios. ©2007 - 11 tracks consisting of 7 originals, 2 co-written (Some Other Mother’s Son, adapted from original poem, "Draft Dodge Mother" by Catherine Lynn, music by Thea; "Take the Walls Down" by Thea and Pamala Ballingham), and 2 covers (Hawk Song/Sail Down by Annie Nance & John York, arranged by Thea, and "Down River" by Erica Wheeler). Yesterday I popped the CD in while I was out doing errands. I absolutely loved it! The CD was awesome! First off - I love the CD. First off - I love the CD. I am moved by your voice and the melodies. I often "take a chance" - but the small sound clips are what sold me. Even such a sample was enough to not think twice about ordering your CD. …you're in my "top rotation." Thanks for sharing your gift of music. peace! s! 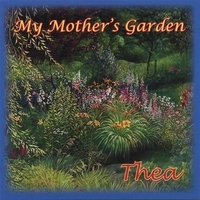 Thea's voice is a unique elemental combination of water and air, refreshing, uplifting, and altogether soothing. She takes that Joan Baez sound into the realm of healing with inspirational lyrics that celebrate nature. You'll love this CD!